According to ADA requirements, at least 5 percent of your classroom tables (and no less than one) must be from 28 to 34 inches above the ground with 24 inches of knee clearance for students in wheelchairs. Tables that are ADA compliant adjust easily to fit different wheelchair sizes and students of all ages. How will your students be using the table? Will they use it as a desk, an activity table, or a computer workstation? You'll find larger tables that can be used as a reading table for students to gather around, and smaller ones for a single student to use as a desk. There are also bi-level tables that work great as computer stations. Motorized tables are the most expensive but are easy for anyone to adjust with the simple push of a button. They operate with an electric motor and can lift up to 450 pounds. Hand Crank tables require more effort to adjust but are lower in price. Like motorized tables, they can lift up to 450 pounds but are more difficult for some students to operate alone. Knob Adjustable tables are the least expensive but take the most effort to raise or lower. Each leg must be adjusted separately with a turnable knob. Flat - Some ADA tables have flat surfaces that simply raise and lower in height. You'll want flat workstations if students set up computers and other equipment on top. Tilt-adjustable - Others adjust in a tilt as well up and down, generally from zero to 50 degrees. Tiltable tables are less versatile but provide a better work surface for activities like art projects that require an angle. Casters - If you'll need to move your table around your classroom or school, some are available with casters that brake securely. 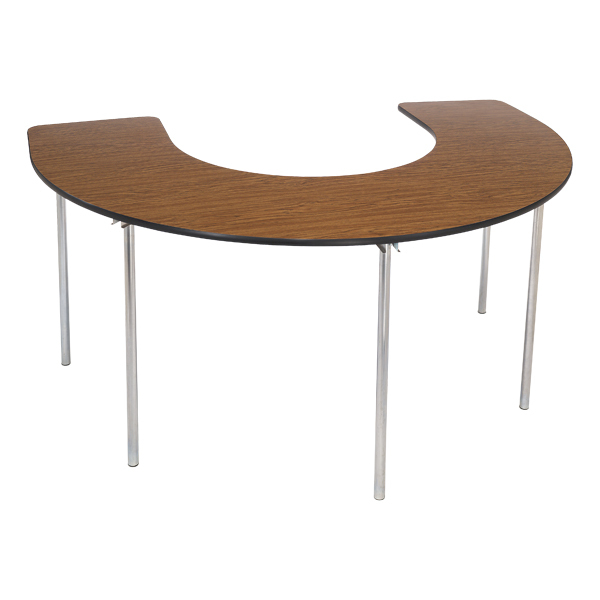 Comfort Recess - A cutout curve in the tabletop lets students sit closer to their work surface, making it easier to reach books and materials. CPU Holder – A holder attaches to the underside of the tabletop and keeps your CPU out of the way. It provides room for bulkier wheelchairs while still allowing students to access computer towers. Cable Management – A grommet hole can help route your cords, and an optional cable freeway keeps them out of the way and from tangling up in chair wheels. Both are inexpensive ways to offer a safer learning environment. Moveable Keyboard and Mouse Tray – An articulating keyboard arm and tilting mouse tray will let your students move computer equipment to fit their needs, rather than the other way around. Shop our selection of Wheelchair Accessible Tables. 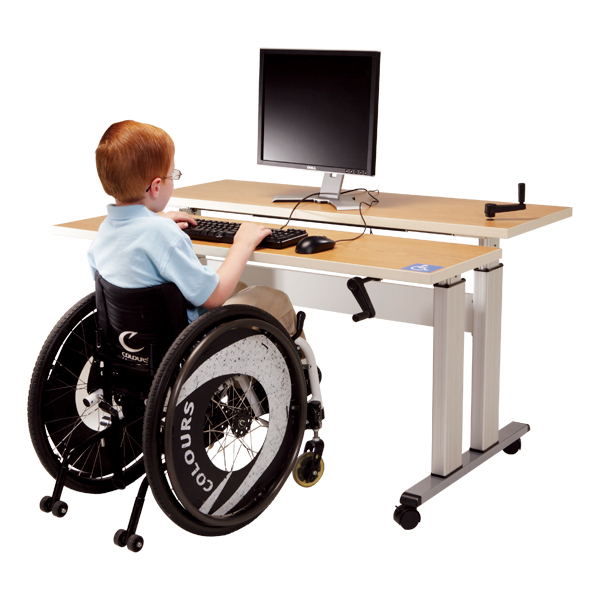 Need a hand figuring out which wheelchair accessible table would work best in your classrooms? Give us a call at 1-800-260-2776. Our friendly sales team is happy to help.